Date: 24 August 2015. Engine Debacles. Some of you may know Seaweed is on her third engine in two years. Every step of the way was logical. Each choice seemed like a Good Idea at the time. And there were moments of perfection when all worked as it was supposed to. Of course there were glitches and a final straw moment. I've left Carrabelle. This is how it all came to be. 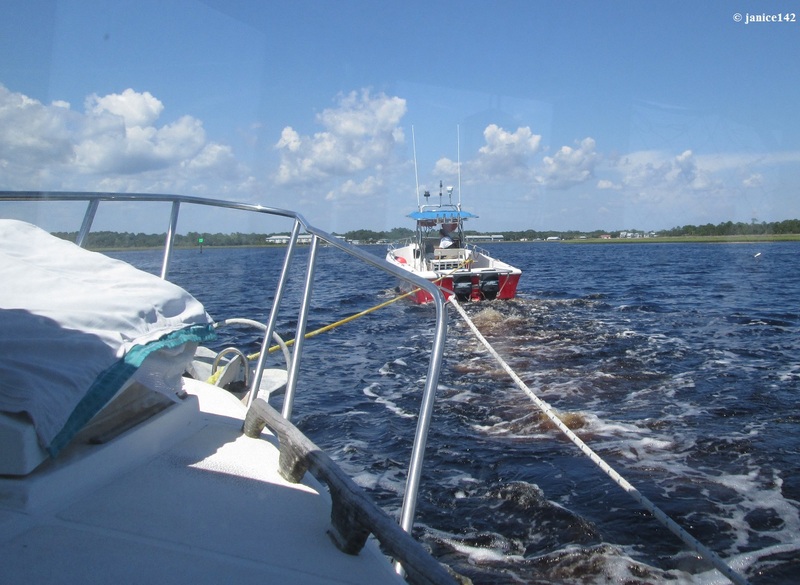 When I arrived in Carrabelle it was at the end of a TowBoatUS rope, having blown my head gasket on The Beast. The Beast was the original gasoline monster. 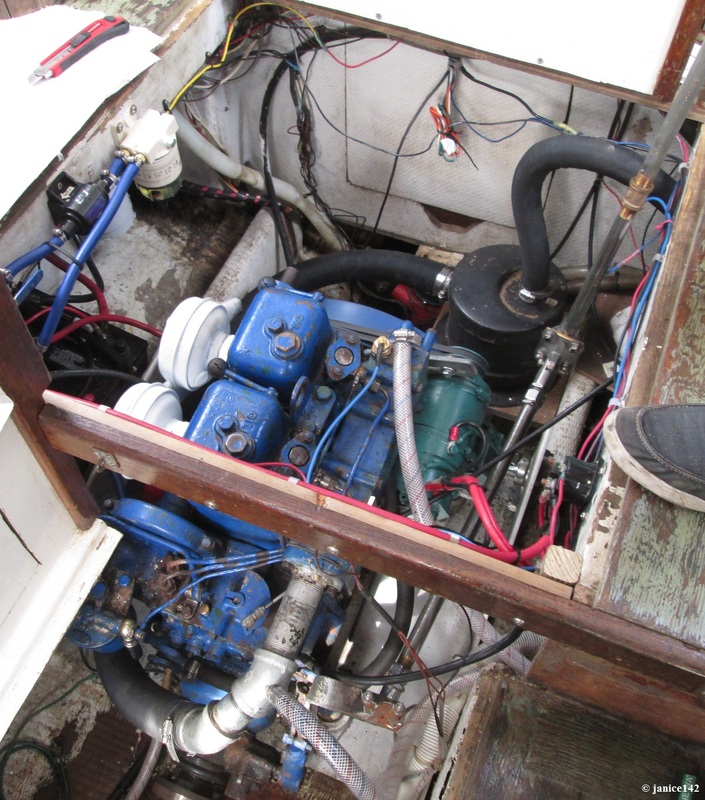 She was a 260hp inboard Mercury and far too powerful for my little boat. The Theory was that she'd go fast with a big engine. The reality was far different. Fully loaded with all my stuff aboard her, the most I've ever seen is seven knots and that was with the current. Later that day I was doing three knots, without touching the throttle! The tide had changed and was against me. Often when the tide changes I'll anchor and wait for the current to be with me. I am already where I want to be, and there is no schedule mandating movement. My boat was made by Schucker. They are known for transom squat. Transom squat occurs when you move the throttle forward to go faster. Instead the transom digs in (gets lower). Your speed does increase, minimally. A level boat burns less fuel. Two weeks after the head gasket replacement was done and sea trials had begun I was offered a small diesel Volvo at a price I could afford. The engine that arrived was quite a bit different than what I'd thought I bought, but that's another story. In any event, after much work, time and money the BOB Volvo was up and running fine. She moved along at five knots with nary a wake. Not even a smidgen! It was fun to "blast past" the no wake signs without making a ripple in the water. By this point I'd been in Carrabelle for right at a year. The town is nice with friendly folks. It's great to be able to walk to the grocery store, library and post office. 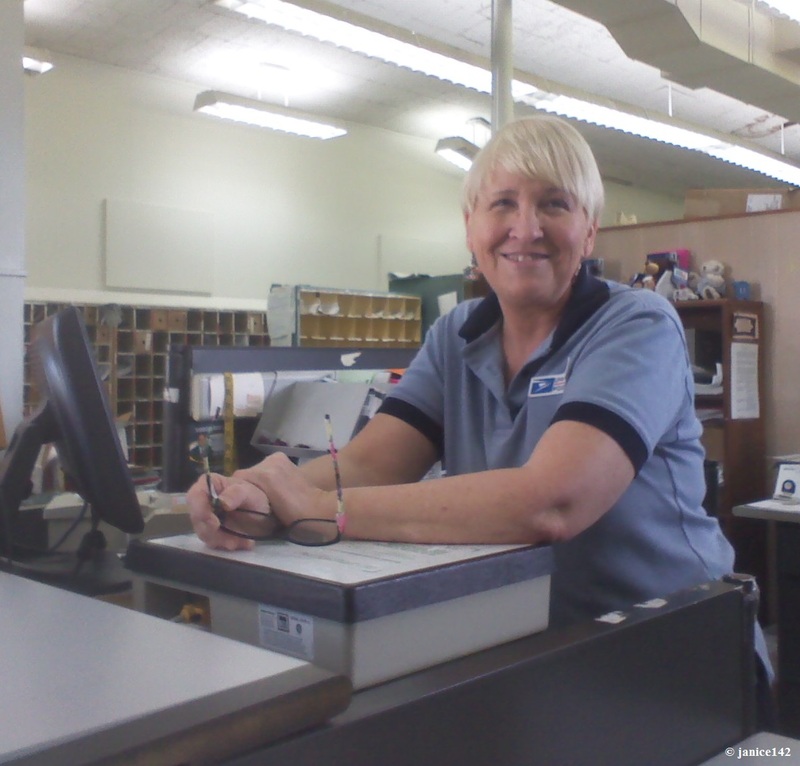 Miss Connie works at the post office and is a favorite. She knows when I've been a bad girl, i.e. shopping on eBay China. It is not so great to not be able to get to Wal-Mart or any of the big thrift stores found in larger towns. I missed that more than you can imagine. To me they are candy stores with lots of inexpensive items I just might be able to use aboard Seaweed. 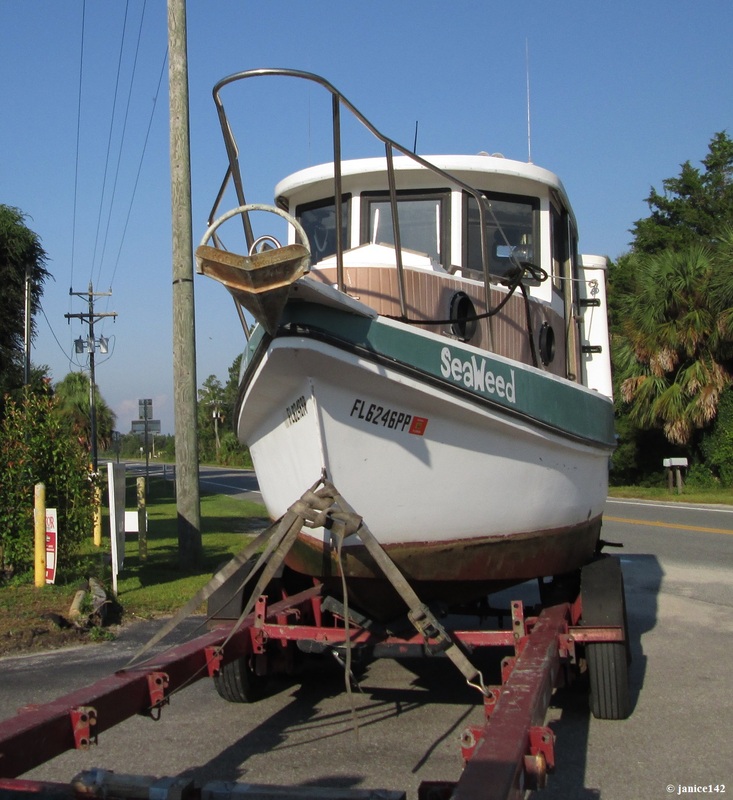 While in Carrabelle I yearned for yard sales and thrift stores. Big ones like Goodwill and Salvation Army are wonderful. Smaller church run places can be better yet. The thing is, I can afford thrift store prices. It's fun to look around and imagine what I can do with items available. Recently I found a blown glass swan that I'll mail to a friend one of these days. Plus, with a bit of effort I can take one item and make it into something else. The Budget Spice Shelf (costs less than $1) article tells about one of my creations. For the record, no I have not updated the spice rack yet. I'm still looking for something to use in its place. However for now it is Good Enough. I made friends at C-Quarters Marina too, and visited them regularly. Once BOB was up and running I took off for places south. In retrospect I should have done more sea trials. Just west of Horseshoe Beach the engine quit. 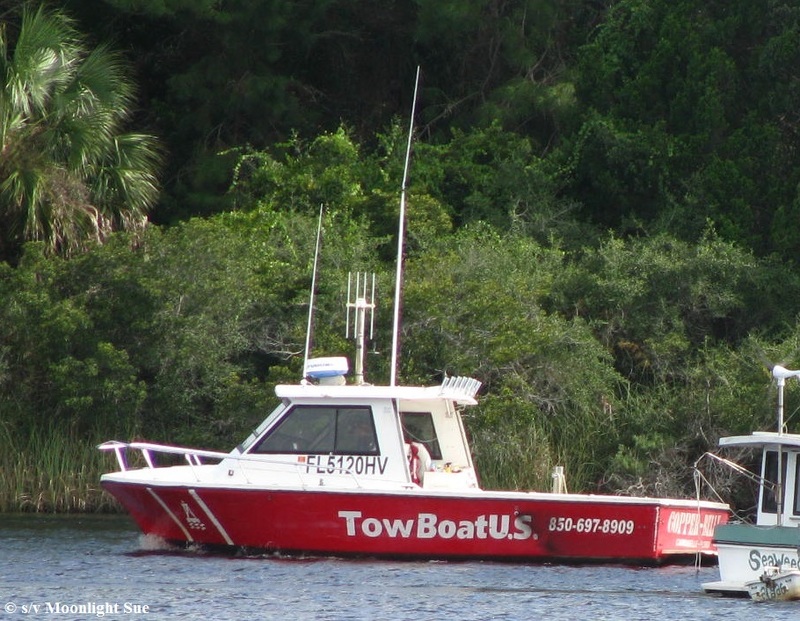 That was followed by a tow back to Steinhatchee. I really hate arriving some place at the end of a tow rope. It's embarrassing! into Steinhatchee when I blew a bearing. Stuck in Steinhatchee with no trusted mechanic in sight and a broken engine, I opted to head back to familiar territory. I hired Marshall Marine to bring me back to Carrabelle. The article detailing that adventure is Leaving Steinhatchee (and engine update). 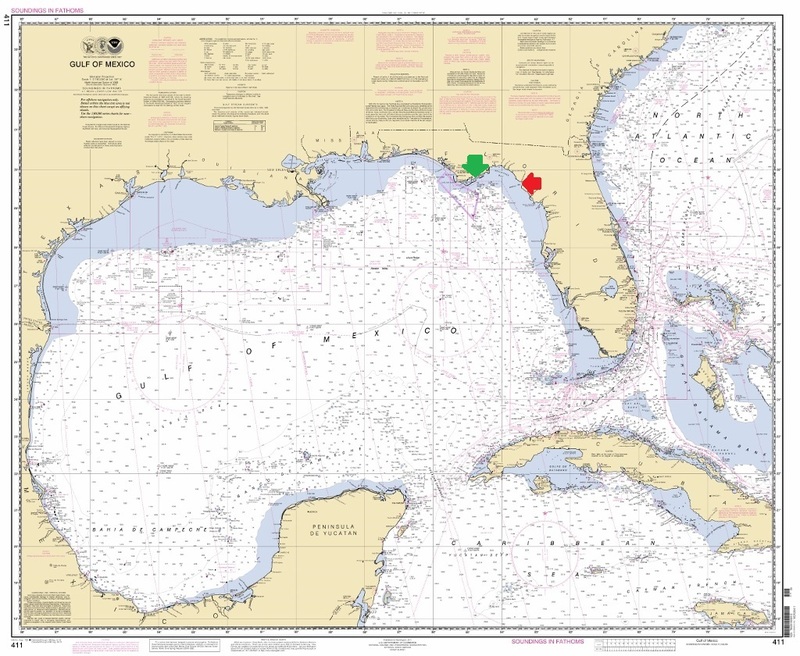 Carrabelle and Steinhatchee are on the Gulf coast of Florida. From there (Steinhatchee) I ended up having Seaweed trucked back to Carrabelle. It was time to start again. Engine number three, the Kubota from Yanmar Tractor Parts arrived a-okay last autumn. I've named her Betsy at the suggestion of a fellow named Steve. Yanking out BOB was heart-breaking. So much of myself and Bob were in that motor. I wanted it to run. That way Bob Winter could continue to cruise with me even though he had the audacity to go to Heaven all too soon. The Time Stopped article is a tribute to him. Bob was my friend. He was not a boyfriend. Instead, over time he became a boating buddy. Being a soloist, having someone to share the journey with is helpful. Each day I'd call him when underway. He phoned too, offering and asking for advice. 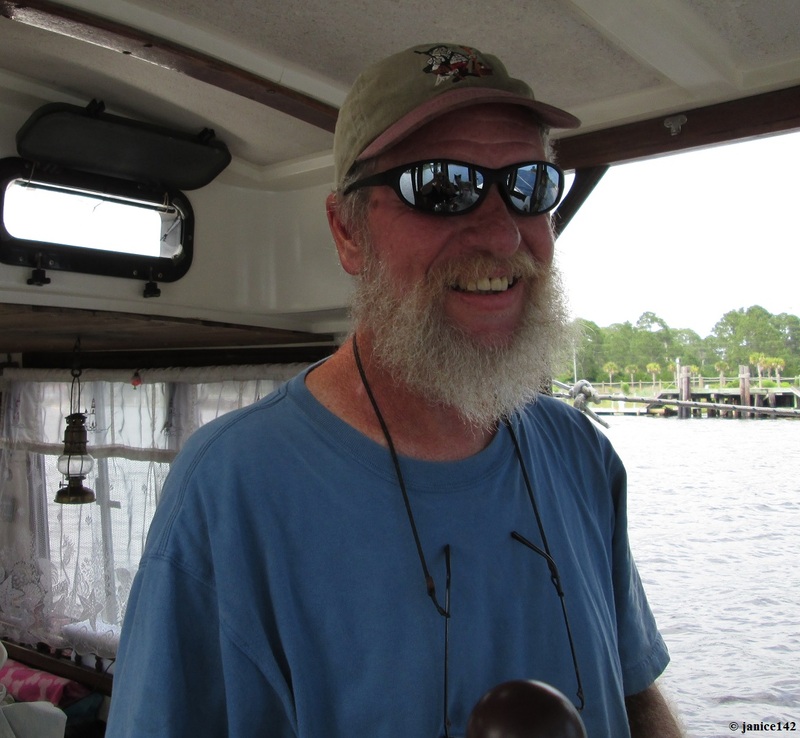 I tell you this much: when I left Carrabelle by boat is was tremendously difficult not having someone to reach out and talk to on the journey. There was no cell phone coverage and I missed not having someone to say "see that pelican" or "did you see the dolphin pod?" the more social aspects of cruising in tandem. When I leave next time, I'm hoping to travel in tandem with another boat. Anyway, that's not here, yet! Note: I am catching the blog up to present. The following actually happened last month. We are still in Carrabelle (imagine it) and one Friday morning I was crushed to discover that the delays would continue to be ongoing. I'd had enough. The one thing I did not do was make an Ultimatum. I did not say finish Seaweed or else. Instead I opted for another solution. Wise or not, I did it. And in the next article I'll tell you about that. And, do you follow through with the Or Else portion? A favorite aphorism: Wisdom consists not so much in knowing what to do in the ultimate as knowing what to do next. Herbert Hoover.